Yesterday evening saw very dynamic weather, with the sky changing from open to overcast and back to open again in matters of minutes. During the short clear periods, the sky was however very transparent. 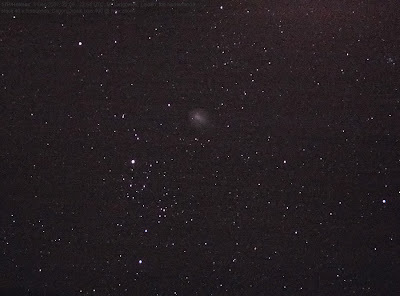 Comet 17P/Holmes was easy to see with the naked eye, as a large diffuse cloud somewhat to the right of alpha Persei. I revised my series of coma diameter measurements. I had been measuring astride the nucleus, but as the position of the nucleas grew more and more a-centric, that no longer resembled the largest coma diameter (perpendicular to the outflow axis, to avoid the tail). So I re-measured all images, this time determining he true maximum diameter. Revised diagrams are below. 17P/Holmes is currently some 3.7 million km large.